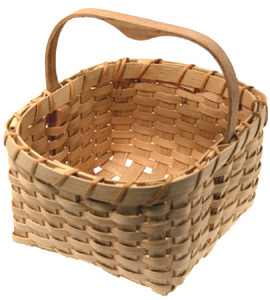 CAPE COD BLUEBERRY BASKET KIT has Shaker-style square bottom with carved and notched oak basket handle. Uses 1/2" flat reed, 1/4" flat, and cane. This is our most popular basket weaving kit. It has an easy to weave square bottom in plain basket weave style. Excellent for ages 14 and up. 6" wide x 7" tall. SKILLS LEARNED: Square base with flat reed, plain-weave continuous weaving, Cut and Tuck, notched handle application & rim lashing are skilled learned in the Cape Cod Blueberry Basket kit.